Full on decorating at this time of year is not really on everyone's “to do” list. However, that doesn't mean you can't embrace the holiday with some subtle hints of celebration around the house. For many homeowners, the garage sits just beside the house and makes up a large part of the property without ever really contributing to the curb appeal. Here you can find some interesting ideas on how to decorate the front of your home and your garage. Your garage door is probably the largest flat-surfaced part of your property. If its panels are made of wood, you can paint them or have them varnished to be whatever color you want. Red is typically the color of this holiday, but there is nothing stopping you from considering darker shades, transparent varnishes or actual artwork. If you have a metal door, it will need to be spray painted and it is often best to let a trained professional handle this job. You should be able to find all kinds of iron and metal decors at homeware and garden stores. This time of year there are bound to be stocks of them made in the shape of hearts and other Valentine's Day symbols. Just like Christmas decorations, they can be stored and saved to be brought out once every year in the future. Wooden garage doors allow you to nail in such features, you just have to remember to fill and seal the nail holes after you remove the decoration. If statues and lights are more your style, it can be a practical choice to place them above the garage. If it is an electric decoration, you may be able to have it share the main power socket used by your garage door opener. Remember that you need to double check that the decorations are not impeding the door's movement in any way. Not all types of doors need to maneuver inside the space above the front of the garage, so if yours doesn't, that's where the decorations can be out of the way of potential collisions and visually available for all to see. 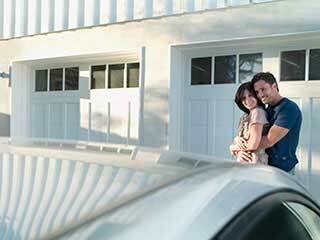 While you're setting everything up, take the time to conduct some garage door maintenance while you're at it. Inspect the moving metal parts of the door for wear and tear damage, and make sure that there are no frayed cables or bent tracks. If you do find a problem, don't try to handle it yourself (at least not if it's more than simply tightening some loose screws). Instead, give our team at Garage Door Repair New Canaan a call.